Self’s Morphic interface actually has a lot of charm, but unfortunatly it is in a early NeXT fashion. Lots of grey. Or is that gray? One of the things which scratches an itch for me is cleaning up the interface to make it more comfortable to use. The guiding principles for this makeover, which come from the idea of Self itself, is the creative intersection between minimalism and humanism. More will be coming – why not join us for the ride? I would like to announce the release of version 4.4 of the Self environment. Self is a prototype-based dynamic object-oriented programming language, environment, and virtual machine centred around the principles of simplicity, uniformity, concreteness, and liveness. 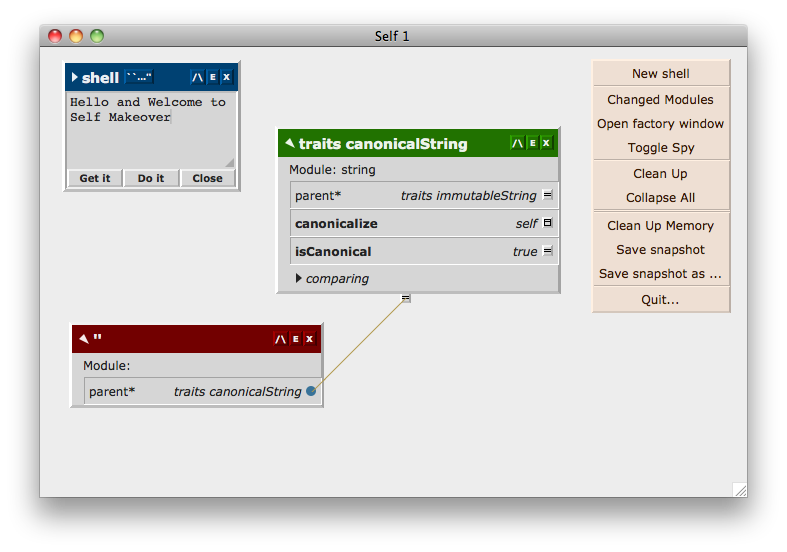 Self is the canonical prototype based language within the Smalltalk family. It is open source under a BSD-like licence and includes a fast VM and a development environment built on the original Morphic GUI that Squeak’s Morphic is a descendent of. various bug fixes and general improvements. I’ve released Self 4.4 Beta 1. Download VM installers for MacOS X and Linux and Clean and Demo snapshots from: http://selflanguage.org/download/. As usual, the sources for the Self VM and objects are available from http://github.com/russellallen/self including as a tarball. Barring minor fixes, I will reissue this release as Self 4.4 at the start of April. The proper description of Self 4.4 is a revived Self running on modern Mac OS X and Linux x86 and ready as a base for new functionality. Please post bugs to the Self bugtracker at http://self.lighthouseapp.com and to this mailing list. Removed some binaries from the git repository, split sortedList out of the list module. Split mirrorProgramming from mirror, so that Klein won’t need to file it in. Starting to refactor the tests to make it easier to use them in Klein. Also refactored the slotFinder to be iterative instead of recursive. Made the javaServer stuff file in OK (sort of, I think). It still needs to be filed in from the terminal, without the Self desktop running. Fixed a typo in some comments, added max: and min: methods to the ordered mixin. After looking through some of the issue tracking sites that people on the Self mailing list kindly pointed me to, I’ve set up a trial issue tracker for the Self project on Lighthouse. It looks like Lighthouse has a good balance between power, simplicity and user friendliness. You can see from the information there that the current plan is to issue a new release in late January, and a hopefully final Self 4.4 on Linux and Mac in late February. We can then move on to more exiting improvements! Documentation is at the heart of any successful open source project and, as Self wakes from its slumbers, documentation is vital to providing a way for interested people to learn and participate. Self has a number of manuals, as well as important published papers, but these have been available only as pdf. Three of these manuals (the Programmers Reference Manual, the Programming Environment Manual and the Morphic Manual) have been turned into HTML and combined into the new Self Handbook, which is available to read on line at http://docs.selflanguage.org. This is quite comprehensive—in pdf form it is at the moment around 140 pages. David Ungar, co-creator of Self, is due to speak to the at the Stanford University Department of Electrical Engineering Computer Systems Colloquium on September 30, 2009. The talk will cover a range of material including, in Dave’s words, “a fair amount of Self in it”. Check out the <a href=”http://www.stanford.edu/class/ee380/”>Colloquium website</a>, which should have links to live video streaming. There is also the possiblity that the talk will be later available from Stanford through iTunes or Youtube. Check out the Colloquium website, which should have links to live video streaming. There is also the possiblity that the talk will be later available from Stanford through iTunes or Youtube.